DETROIT (AP) — For some of the 200-plus cities knocked out of the running for Amazon’s second headquarters, the effort may turn out to be a trial run for other opportunities. But they’re advised not make the same kind of promises to just anyone. Cities like Detroit, Memphis, Tennessee; and Gary, Indiana, failed to make Amazon’s first cut as the online giant narrowed its list to 20 prospective sites for the $5 billion project that could employ up to 50,000 people. Looking on the bright side, several leaders whose proposals didn’t make it say the time spent putting together juicy tax incentives, massive chunks of land and infrastructure studies was not wasted. “We used this opportunity to showcase all the options in Delaware not just for Amazon, but for any business looking for a location to set down roots and grow,” the state’s governor, John Carney, said. “This exercise showed us new ways to showcase our city that we are already using to attract other businesses,” Memphis Mayor Jim Strickland said. Seattle-based Amazon made clear that tax breaks and grants would be a big factor in its decision. Maryland Gov. Larry Hogan floated an incentive package of more than $5 billion to lure the second headquarters to Montgomery County. New Jersey’s pitch contains $7 billion in tax breaks and Boston’s offer includes $75 million for affordable housing for Amazon employees and others. Generous tax breaks and other incentives can erode a city’s tax base. Economists have said the Amazon headquarters is a rare case in which some enticements could repay a city over the long run. But the pursuit of Amazon could re-ignite an incentive war between cities, regions and states to lure companies and jobs, says Tim Bartik, a senior economist at the W.E. Upjohn Institute for Employment Research in Kalamazoo, Michigan. Amazon’s list includes New York, Boston, Los Angeles, Indianapolis, Washington, D.C., Denver, Miami, Atlanta and Chicago. Texas’ Austin and Dallas made the cut, as did Philadelphia and Pittsburgh in Pennsylvania. The others are Columbus, Ohio; Montgomery County, Maryland; Nashville, Tennessee; Newark, New Jersey; Northern Virginia; and Raleigh, North Carolina. Toronto also is on the list. 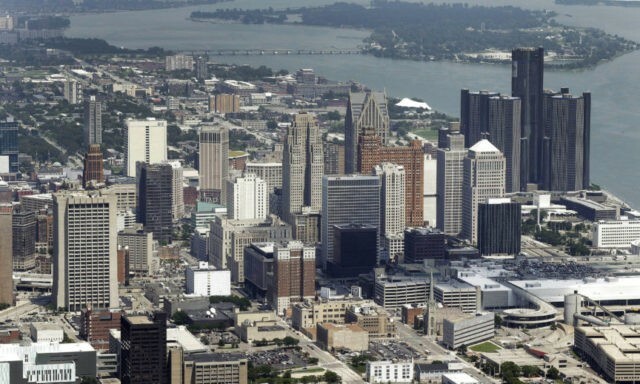 Detroit’s absence from the list muted what many see as an exciting time in the city as it makes progress since its 2014 exit from bankruptcy. Businessman Dan Gilbert led the team that put together the Motor City’s proposal, which included a video showcasing the city and a more than 240-page, color, spiral-bound book. The cost of the proposal has not been revealed. Some spent big on their pitches to Amazon. Worcester, Massachusetts, released invoices showing that it spent more than $10,500 on its proposal, most of it on a video. Connecticut shelled out $35,000 for renderings and drone footage. Virginia Beach, Virginia, reported spending at least $85,000. That included $3,000 to build a sand sculpture at the beach to promote its application. For areas considered longshots, going after Amazon was a bit of an experiment. “As much as this process helped identify our major assets, it also helped us to assess our gaps and where we can continue to improve,” said Birgit Klohs, chief executive of Grand Rapids, Michigan-based The Right Place, Inc. The economic development organization was part of the team making the pitch for Grand Rapids. Gov. Chris Sununu said New Hampshire’s proposal “was the most comprehensive business marketing plan” the state had produced. “We are excited that it is already serving as a template for other businesses that now have New Hampshire on their radar,” Sununu said. He did not name specific companies, and Democrats argued that if Sununu truly wanted to attract businesses, he would invest more in education, workforce development and increasing the minimum wage. Associated Press writer Josh Cornfield in Philadelphia contributed to this report.